Discussion in 'Non OEM Ink & Cartridge Suppliers' started by Classic Shots, Sep 29, 2018. The clogging problem with pigment inks is probably not as severe as you may assume, just print something - small images, color patches whatever on a somewhat regular base, not even every day, and clogging shouldn't be an issue. and separates from there and you get bubbles at the end under your lamination. It does not happen equally with all types of papers or not at all or within a few days, you cannot forecast that effect. And be aware that about all refill dye inks give you a much worse fading performance than genuine HP, Epson, Canon inks. And you would need to ask yourself whether it is the best approach to protect fast fading refill ink prints with lamination. 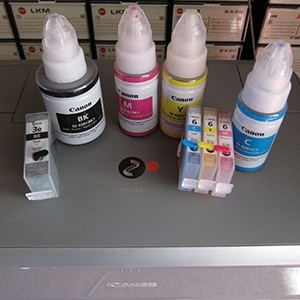 Against the hp t610 i have an option of the epson stylus pro 7890 and inksystem refill inks. will this be a better option, anyone has an experience with the inksystem inks? The Epson 7890 is a pigment ink printer for roll paper only, I'm wondering that you mention to make 5x7 prints which is probably not a suitable size for such a model. I think you rather should go for a desktop model handling sheet paper like the Epson P400 , Canon Pro10s or Pro1000, all with pigment inks and a gloss/chroma optimizer for the best look on glossy papers, such prints won't need lamination, and refill options would be available. Artur5, stratman and The Hat like this. A very long break for me indeed. Thanks ink stained fingers for the recommendations. done the reviews and the p400 carries the day. I live in Nigeria, so the next issue is how to get one down. working on it right away. Thanks.